Category Archives for "Back To School"
As we head back to school for another year of writing, I thought I would just take a minute to share my 5 top tips for teachers who are new to teaching writing. 1. Do all the writing tasks yourself first. I am a firm believer that if I want students to complete any writing task (small or large) then I need to do it first. Why? It’s the same reason why we read the text before we teach it. I need to know that the task I’ve set will achieve the outcome I’ve planned for. So rather than just project a picture of an elephant and say write a description. I write the description. The side-benefits of completing the tasks yourself are: you can create mentor texts that suit your students; it helps with pacing – writing ALWAYS takes longer than we think (doing the writing yourself proves this); it helps you understand the ‘in brain’ process your students will go through (so you can support them better when they get stuck); and it can help you spot with misconceptions and simple errors. This sounds obvious, doesn’t it? But let me break it down why it’s important. There are so many skills that we teach and test for in writing. The technical aspects of grammar, spelling, sentence construction, dialogue. Then you have narrative structure, character creation, mood, atmosphere, action, resolution. Finally, there are things like word choice, punctuation, literary devices, genre writing. So, for every writing task you set – make sure you and your students are really clear on which of these (and all the others) you want them to focus on. Make it explicitly clear for them. This tip goes hand in hand with number 2. Creative writing can be (and often is) as stressful and terrifying for students as essay writing. Even students who are readers often can’t see the creative thought process that results in a great story, so we need to show it all to them. That means actively teaching and then demonstrating narrative writing, story structure, character, description, action, dialogue, transitions, literary devices, paragraphing – the list goes on. Show your kids good examples, bad examples, how to fix mistakes, how powerful editing can be. I don’t call these quick writes because I don’t want to unconsciously indicate that writing can and should be bashed out in 10 minutes. Even if that is the only time I can give a particular task. As all writing (whether it’s about practising sensational similes or creating complex characters) is about creating moments that the reader will remember, I use the term ‘miniature moments’. What are these exactly? Well, they can be anything you want. Lasting from 2 – 10 minutes, these activities are fantastic for focusing on a handful of key elements that contribute to a larger piece of writing. Say for example you will spend the lesson looking at descriptive writing – then your miniature moments could be: listing nouns, sourcing adjectives that add clarity, testing out metaphors, writing open lines, creating a 1-minute piece of dialogue. These miniature moments in themselves should all be compelling pieces of writing, but together that serves as great reminders of everything students need to remember! I love miniature moments so much I created a 12-month writing calendar full of them! Have a look here if you are in the US or here if you are in the UK! 5. Harvest vocabulary from texts. This might be my favourite tip. Whenever you read anything with your class – whether you are doing a writing unit or not – harvest vocabulary from the text. There are a couple of ways you can do this: 1) as you are reading together and come across a cool word, make a note of it; or 2) nominate a student or two to be in charge of writing down cool vocab as you are reading. Then I like to make a display of all of the words we’ve collected – this year we made this one. If you are curious about how I teach vocabulary in the classroom then check this out. If you would like to hear more about teaching writing from me and would like to receive writing prompts and teaching ideas, please sign up for my weekly writing email below! If that wasn’t incentive enough – you will receive my FREE mini-guide for teaching descriptive writing! in Back To School , Community , Creative Writing , Freebie Included! 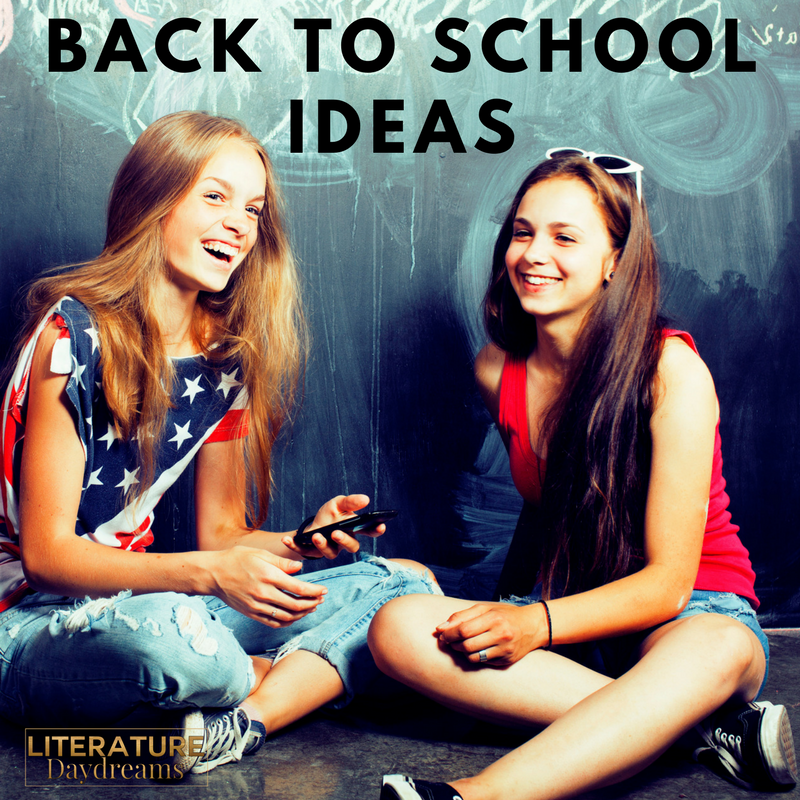 1 fab idea for back-to-school! The first few hours or days back at school are hectic. Timetables to give out, courses to enrol, books to organise. Annndd in my case – uniforms to check, planners to sign, and inevitability parents to call about incorrect shoes, hair, make-up, skirt length, nail varnish. We are busy: sorting out seating plans, handing out new books, sorting out target sheets and stickers, homework schedules, IEPs and TA resources. Yup – back to school is hectic. Sometimes we just need a little bit of time. For my new classes with older students – I like to gain 10 minutes or so with a few easy ‘get to know you’ activities. Espresso Yourself – does that just that. Buys me 10 minutes to calm, followed by quality chat with the kids I have only just met. While I am muddling through the register and seating plan, they are telling me everything I need to know about them. 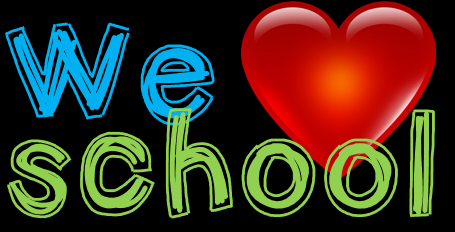 How do you love to get to know your HS students? I’d love to hear your ideas in the comments below. You can download my Espresso Yourself worksheet (and a few other goodies) here for FREE. Enjoy! As the new school year approaches, I get a feeling – the same feeling I get every year – nervous and excited. I know that I will be meeting a bunch of new students: some I’ve never taught before, and some returning faces. For each of these kids, I make a silent promise each September, that I will really see them. That I will take the time to get to know them. That they won’t fade into the background. That even though I will only see them 3 times a week (sometimes less) that they will be known in my classroom. So I do all the usual stuff: learning names, memorising faces, greeting at the door. Yet, it isn’t our classroom chat that helps me find out who these kids really are. It helps for sure. But there is something I do with my students that, every year, blows my mind without fail. It is to have them write me a letter. In fact to have them write me lots and lots of letters. A letter, a week for the first full term of school. That’s 13 letters, 13 chances for them to tell me the stuff that matters. I love letter writing. It’s been ages since I’ve received anything more personal than a greetings card in the post. When I receive a letter, well, that’s something special. I like to tell kids about how when I left home, there were no mobile phones, no email or FB. I mean it was the 1990s, man! If we wanted to keep in contact with friends, who had moved to another part of the country, we had to write a letter. I moved to London. My best friend moved about 400 miles away to the Scottish borders. We would write each other once a month – sometimes 10 sides of paper or more – I loved receiving those letters. Letter writing, like diary writing, has been replaced by 140 characters or a fuzzy selfie. As letters are by their very nature personal – when we lose them, we risk losing a deep knowledge of human nature. Today we can watch fast moving news events live. But what about the people involved a week later or a year later? Letters allow us time to reflect on our circumstances. If ever a species was in need of a pause button, it is humanity. 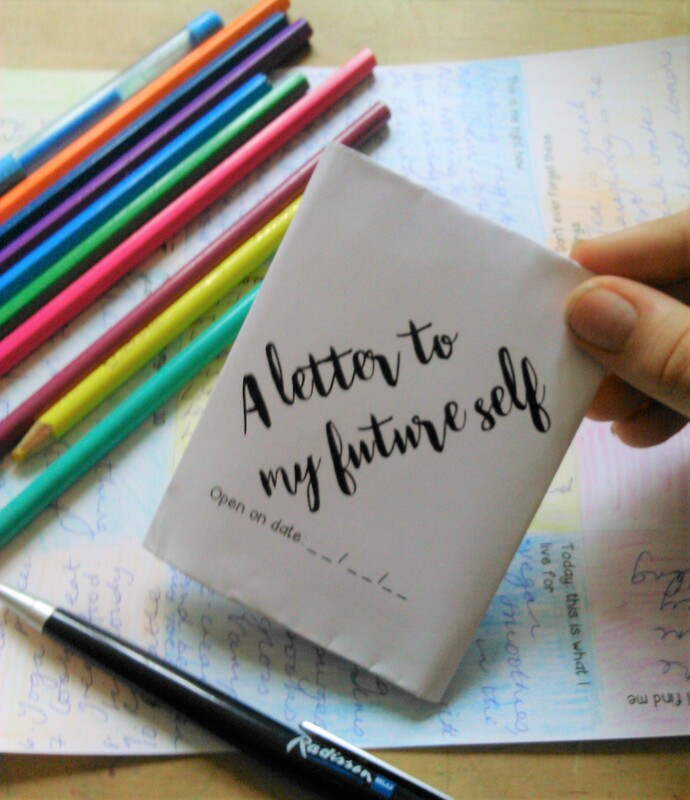 The first letter that my students write – is a letter to their future selves. Meh. You might say. Been there, done that. Well, this letter is something a little different. Perhaps because it isn’t a letter at all. I like to ease my students into the idea of writing me a few pages. It’s more a series of thoughts, or reflections, a collection of hopes and dreams. We write this first letter in class. Students color in the different sections and then hilarity follows as I show them the complicated way to fold it up to make a ‘Renaissance folded letter’. I explain that paper and postage was very expensive in 1600s-1700s. Envelopes would have been a huge waste. So people learnt to write on every available space, except for the space with the address and the wax seal. This moment has another purpose. We learn to laugh together. We learn to fail together. We become a team in this lesson. After this first lesson, I set my students a letter writing homework each week through September, October, November, and December. We have a few mini-sessions on the “Lost Art of Letter Writing” (start with a greeting etc) but other than that, this is one of the rare times my students get to do writing without overly structured input. They do have a rubric, but I have to be hands-up-honest here and say, I don’t always mark their letters for grammar and spelling and stuff like that. I find myself thanking students for sharing something, more often than not I find myself asking questions, wanting to know more. At this point for me, these are more than marks on grade sheet. And my kids need to know that. There is not topic I won’t set, and depending on the age group of my class, we have covered them all. From ‘what is love’ to ‘my best day out’. From ‘is Britain a dystopia?’ to ‘is free speech really a good thing?’. Students know that they letters are set for them to think through a particular topic. To express their beliefs, opinions, and whatever muddle comes in between. Many times a student will start out with “I believe…” and by the end they have found some different thoughts. While I am being honest, I also what to tell you about the unexpected and awesome benefits of these letters. These were totally unplanned by me when I was developing this idea. First off, my students are more confident to express their ideas and opinions in my classroom. Yay! Less tumble-weed and more “I’m waiting for quiet!” but in an ELA classroom debate, discussion, and ideas are at the heart of what we do. Second, I discovered these kids are funny and clever and may does that give me hope for the future. (This one probably should have been first up). Last but by no way least, my students are better writers. And that’s my day job. These letters push them to think on topics they don’t really think about and they are improving in their writing and their expression for it. So my advice – get your students writing letters. If you are interested in using this idea in your classroom. Click the image below.